(Nanowerk News) Although the van der Waals force was discovered around 150 years ago, it is still difficult to quantify when predicting the behaviour of solids, liquids, and molecules. Precise measurements were only possible up to now for single atoms or macroscopic objects. However, the van der Waals forces are particularly important at intermediate size, where they crucially co-determine the behaviour of complex molecules, such as biomolecules and proteins. They are also responsible for the functioning of certain adhesives and are the reason why geckos can adhere so amazingly well to surfaces, even allowing them to climb smooth walls. "Using our method, we determined the van der Waals force for the first time for single molecules throughout a larger distance range," says Dr. Christian Wagner. The measured values agree with theoretical predictions, according to which the binding strength decreases with the cube of the distance - which explains the extremely small range of the interaction. 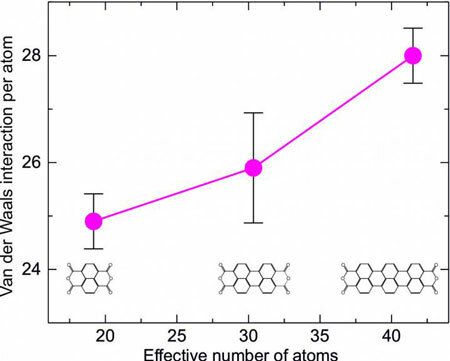 The new study ("Non-additivity of molecule-surface van der Waals potentials from force measurements") also revealed that the bigger the molecule, the stronger its attraction to the surface. In reality, this effect is even stronger than simple models predict and also than would be intuitively assumed. "Usually, only the interaction of all those atoms involved is added together. But the van der Waals forces that we measured are 10% higher than this," says the physicist from Jülich's Peter Grünberg Institute. What is the reason for the superlinear increase? The van der Waals force, to put it simply, emerges due to the displacement of electrons in the shells of atoms and molecules, caused by quantum fluctuations, which leads to a weak electrical attraction. In the case of larger molecules, more atoms are involved as each of these molecules also comprises more atoms. And on top of this, each and every atom contributes more strongly. "As large organic molecules often form electron clouds that stretch across the entire molecule, they offer electrons considerably more room to manoeuvre than a single atom," says the head of the young investigators group at Jülich, Dr. Ruslan Temirov. "This makes them easier to displace, which overproportionally increases the electrical attraction." For the measurements, the scientists affixed complex organic carbon compounds, which they had attached to a metal surface, to the tip of an atomic force microscope. They had secured this tip in turn to a vibration sensor so that the tip moved back and forth rapidly, a bit like a tiny tuning fork. When the molecules are removed from the surface, this vibrational frequency alters, allowing conclusions to be drawn in relation to the van der Waals forces, even when the tip is withdrawn a few molecule lengths (approx. 4 nanometres) from the surface. The values determined are particularly interesting for simulation calculations using density functional theory, the development of which was honoured with the Nobel Prize in 1998. The technique is the most commonly used method today for calculating the structural, electronic, and optical properties of molecules and solids. Despite its many advantages, it still has problems correctly predicting the van der Waals forces.